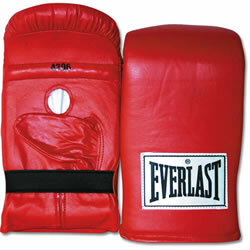 Protects the hands while boxing. Has a padded palm. Select, top quality, genuine cowhide. Special grip-curved palm for better comfort and gripping. Leather bound and nylon sewn with heavy cotton twill cotton lining. (One size fits all). 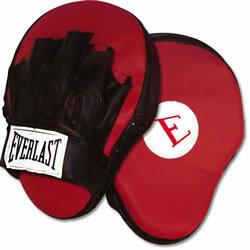 Protects the hands while boxing. Made from select top quality genuine cowhide. Curved design allows for greater ability to absorb punches in an anatomically correct hand position. Smaller surface helps develop timing and sharpened speed combinations. Constructed with 100% vinyl and a three layer sandwich of foam for support, protection and longevity. 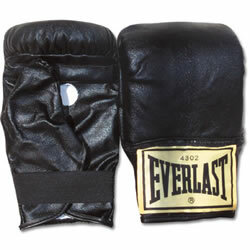 Synthetic leather glove with dense and resilient foam padding. Velcro® wrist strap for comfortable fit. 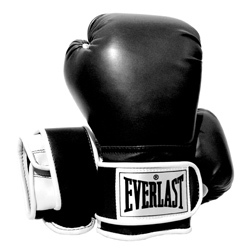 Includes Everlast's Thum-Lok™ feature. 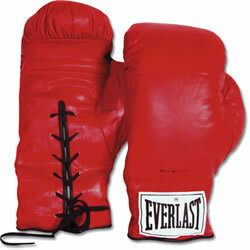 Protects the hands while boxing. Includes thumb-lock.